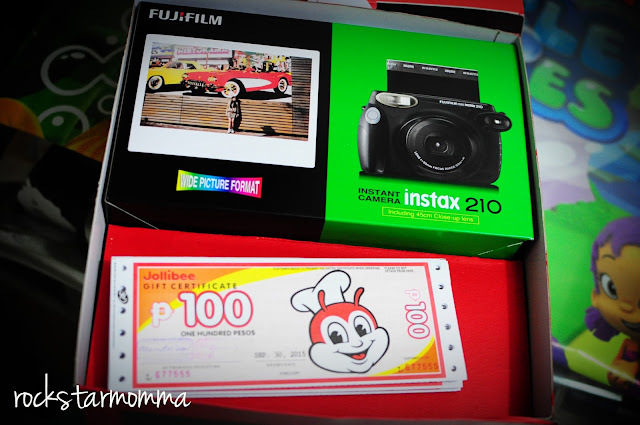 Last Monday, I received a mysterious box from Jollibee that looks like a camera and guess what... the box was an invitation to join Jollibee's Spaghettiest Moments Challenge! Seriously, I'm glad to be one of the lucky bloggers who were chosen to take part in this interesting and extremely fun challenge. 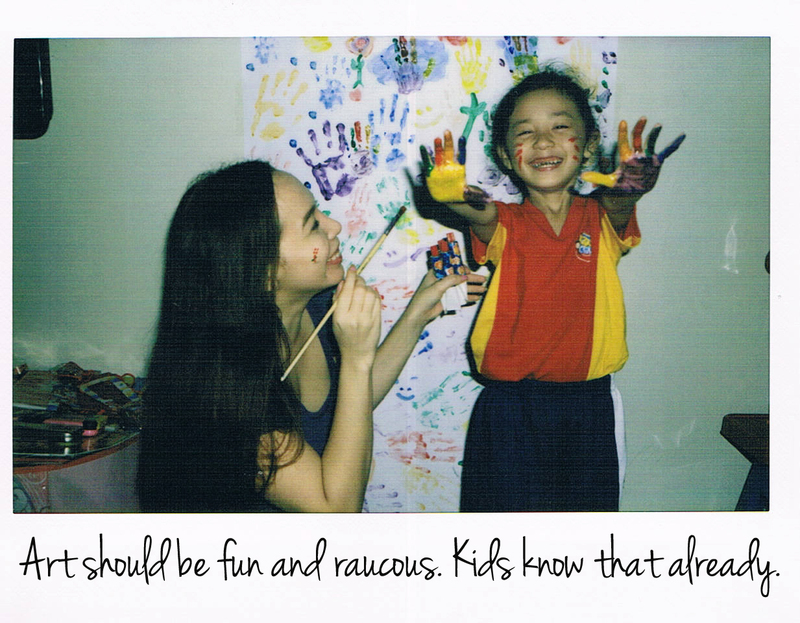 The Task: Our family will go to our favorite places where we normally have the most fun and take 10 photos using the Polaroid camera and limited films provided. Yay! This is a golden opportunity to share happy memories with my family and it's nothing more than a chance to capture my daughter's happiest moments while eating the sweetest and spaghettiest Jollibee spaghetti. Easy peasy lemon squeezy! Happiness starts at home. There is nothing better than having a place you can call home. A place where kids feel happy and loved, or a place where they can learn something new each day from the ones who love them the most. One of our favorite family bonding activities is eating together. Fyi, the only spaghetti my daughter eats is Jollibee spaghetti and the only numbers I memorize by heart during impromptu dinners and movie nights are "8-7000." Jollibee Spaghetti brings out Maia's biggest smile so I don't mind spending just to see that big smile on her face. 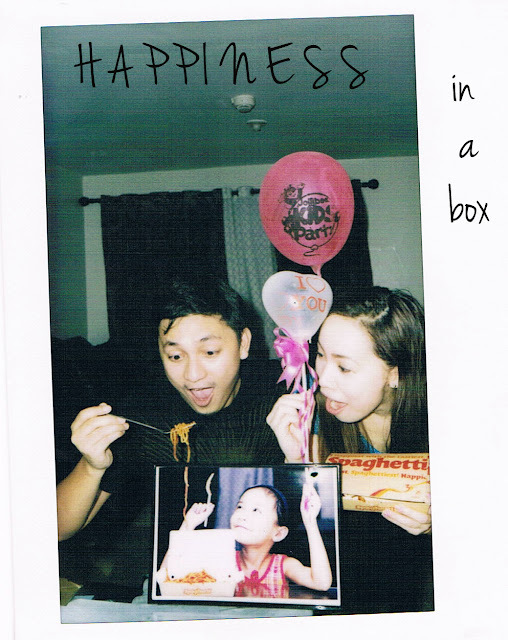 Anyone can find happiness in a box of Jollibee Spaghetti! Life is too short to not spend every moment making the person who makes you happiest happy in return. My daughter's happiness brings back to mind a series of happy memories from my childhood like my first bite of Chickenjoy or the first Jollibee kiddie party I attended. And now, whenever I try to think out of the box, the only picture that comes to my mind is a box of Jollibee Spaghetti that we all love. For some people, it's just a simple box of spaghetti but to our family, it's a box of the meatiest chunks served on a bed of pasta and smothered with the cheesiest and tastiest sauce ever! Art makes my little budding artist so happy. Getting involved in my daughter's hobbies, whether it is painting nails or fingers, shows support of her chosen activity and allows her to feel she can express her happiness in any way. I've witnessed her creativity in action with the arts & crafts activities at Jollibee Kids Club Talent Camp last summer. At home, she's busy dipping her hands in jars of finger paints and swirling yellow, red and blue on a paint-splattered drawing paper on our wall. Some kids are born with silver spoons in their mouths but I think, my Maia was born with a paintbrush and crayons in her hands! After all, Picasso himself said, ”Every child is an artist.” With our funny faces covered in colored paint, this photo is a beautiful work of art and even Picasso couldn’t have painted a more picture-perfect smile for my happy, art-loving little girl. Jollibee is like our second home where most of the happiest moments happen. Every time we go to Jollibee, it's only natural for me to get a little choked up while my daughter is busting out the biggest smile she has ever had. It's because one of the first words she mumbled when she was still a baby is "Ah-beeh!" which means Jollibee. That's the reason why we decided to have her 1st birthday party at Jollibee and even if we don't throw her a party every year, it's a tradition that we always celebrate her birthday there. Be it a big birthday party or small, intimate dinner with the family, a big bite of her fave Jollibee spaghettiest makes her the happiest birthday girl ever. Check out how happy she was at this Hello Kitty party that we attended last week. Now, we're saving up for one because she really loves Hello Kitty and she asked us (with her sheepish smile) if she can have a Hello Kitty party too. If I could wish one thing in my life, it would be that my daughter grows up happy. She is our heart and soul, and she will always be our baby girl even when she grows old. So yes, Hello Kitty party it is! Winning moments are always the happiest! It's every kid's dream to win a stuff toy at an arcade. Not only is it a nice souvenir to take home that the majority of kids don't get very often, but the story of how kids do it is part of the joy. After months of collecting tickets, she finally got her dream Hello Kitty toy. The smile on her face is priceless. By far the most crazy fun slide ever! Memorable and happy moments like this deserve to be taken on a Polaroid camera. One of her happy places is the slide at the playground. 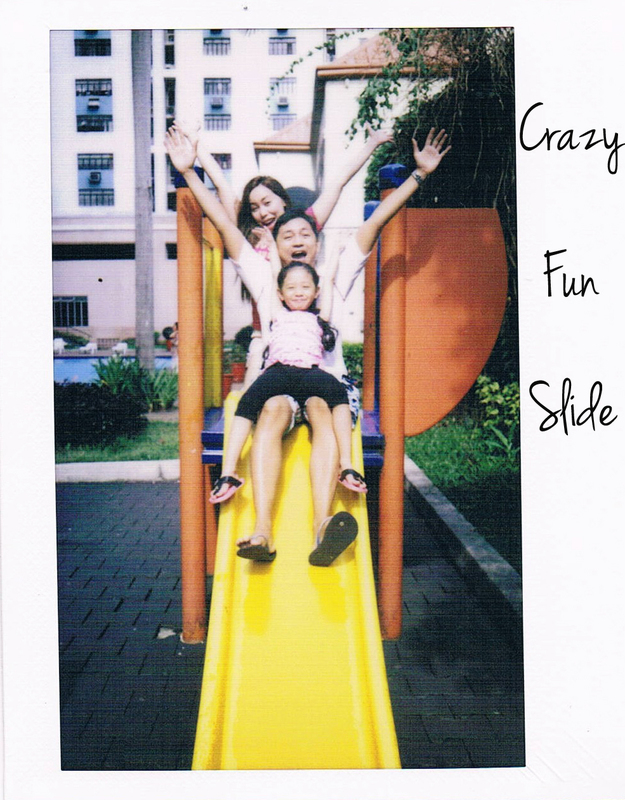 One kid with 2 adults, 32 and 30 years old and yes, we still go down the slide! We never grow old at heart! Her face says it all. In an instance of pure youth and happiness, Maia made a goofy "belat" face. That happy face gives us so much happiness! This is one of the greatest and happiest photos I've ever seen. She's teasing her dad that she's not going to give him Jollibee Spaghetti. As a mom, I couldn't help but flash a smile for them. Maia loves to ride her bike at the playground. 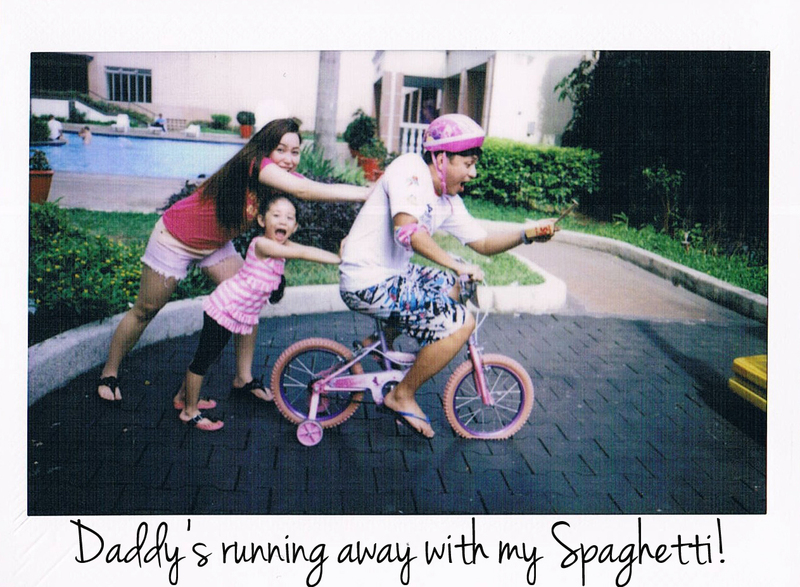 In this photo, Maia roars with laughter as her dad tries to get away with her bike and her favorite spaghetti! Oh, and we look ridiculously happy in this picture. Being with my daughter makes me happy but seeing her unbelievably happy makes me the happiest mom on earth. That said, my happiness grows each time I look at this photo then I take a big bite out of my happiness and I'm sure you can taste the reason why I'm smiling. Happiest is when we create and share the moment with others. In this photo, Maia was sharing a moment of happiness with these kids who live on the streets. Parents should never miss a chance to get their kids out to run, walk or to simply explore the streets. I love running and it's what I always love to do with my family. We were supposed to take our photo eating our carbo-loading snack (that is Jollibee Spaghetti) after our weekly morning jog. However, a little boy on the street asked Maia if she can have her Spaghetti. Then, Maia asked me if we can give our food to the kids because they're "wawa" and hungry. She said we can just buy a new one, and that's exactly what we did. A grim reality today, countless children who call the streets their home deserve to be fed, cared for and taken care of. I'm glad my daughter knows how to share her blessings at such a young age. Itoy, the boy wearing light blue shirt had the most contagious and carefree laugh I have ever seen, his eyes sparkle with so much joy - you can almost hear him giggling. Simple joys like eating Jollibee spaghetti, brings happiness to these kids who have no money, no slippers, no food and no real family to grow up with. This photo makes me think how we actually measure wealth and happiness. So many of us who are living in clean homes with sterile, safe environment, suffer poverty of hope and spirit. On the other hand, these kids seems to float during a shared moment of happiness. And look, my daughter is the happiest among them all. After all, happiness is sharing. You will never lose happiness by sharing it with others, because sharing only makes it last longer. It is true and honest. No other challenges evoke the level of happiness and emotional response that it does. Why? Because it's real. However, using a Polaroid camera that I haven't used before and shooting with wide angle lens is quite challenging. With only 10 films provided, it takes a ton of courage to shoot closer to the subject. However, capturing these photos is something that's indescribable, a sight that anyone who loves Jollibee could smile at. These photos made my week from which I can just feel our happiness pourin' out, photos that most say "Happiest with the Spaghettiest" through an Instax 210 lens. 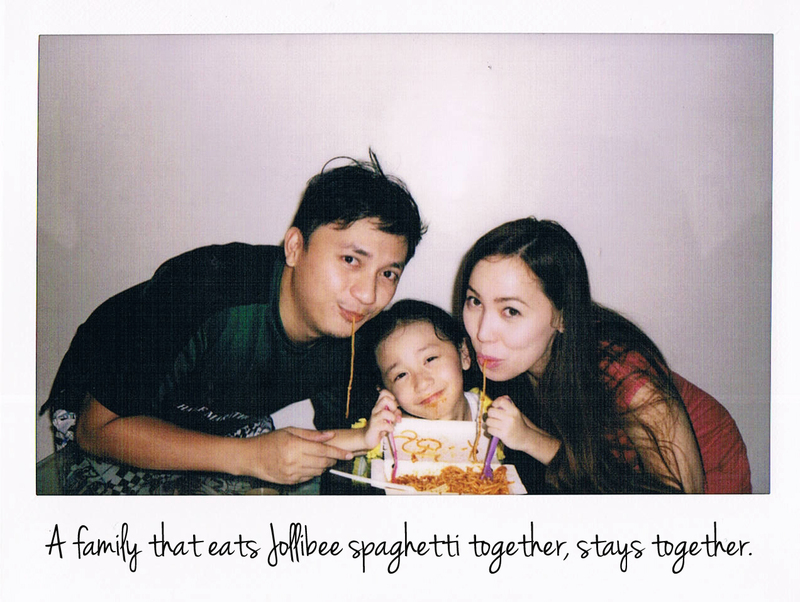 Indeed, Jollibee Spaghetti brings out the most fun you can have with anyone, it's when you have the biggest smile on your kid's face, either celebrating something great that just happened or a moment that brings a family together. Tick tock, tick tock. The clock is tickin', go create your happiest moment today with Jollibee's Spaghettiest. What is your happiest moment with Jollibee Spaghetti? Feel free to share your thoughts below. My Happiest moment with jollibee spaghetti when I was a kid around 12.. Salat kami sa pera kung kayat hindi kami nadadala ng mama at papa ko sa jollibee..Kaya noong nka.side line ako..at sinuhulan ako ng kapitbahay namin nang 100 pesos.. dali dali kong sinama ang mga bunso kung kapatid sa jollibee at umurder ng spaghetti at burger.. Ang saya ko noon dahil napakasaya ng mga kapatid ko..
trung tâm ngoại ngữhắn ngưng tụ thành một quả cầu màu xanh hung hăng công kích về phía bản thể Bát Sí Linh Mãng của Yêu Huyên. Bát Sí linh mãng khổng lồ cũng tránh qua một bên, sau đó mang theo một luồng lực lượng cuồng bạo đánh trả. Bs há bốn cái miệng máu, mang theo một mùi hôi thối tràn ngập, phun ra một luồng hơi màu vàng. Thần hình to lớn của Yêu Huyên đã hung hăng đánh bay quả cầu màu xanh của Thanh Sơn lão tổ, đồng thời thân thể khồng lồ cũng tạo ra bốn quả cầu máu bắn tới. Thân thể của Thanh Sơn lão tổ cũng bị chấn động, thanh mang của hắn đã bị đánh nứt. My happiest moment with Jollibee's Spaghettiest is the simple celebrations we create in Jollibee. Those celebrations need not be grand. We just order our favorite Jollibee spaghetti and we will have a race. The first one to finish a plate gets to enjoy another plate of spaghetti. It's so funny how my kids' faces would look like after eating. Haha, their face covered with sauce, their clothes dirty, but we're all happy. What matters most is the kids happiness, and where in the world can we find it? Only in Jollibee's Spaghettiest! Wow!! Ganda ng mga photos. Happiest talaga pag Jollibee spaghetti! Pinakamasarap ang spaghetti ng Jollibee kasi Pinoy style. Favorite din yan ng anak ko. Happiest moment ay nung grumaduate sya sa elementary at nung birthday nya. Kahit anong occasion, dabest pa rin sa JOllibee! The best ang jollibee spaghetti ng jollibee..winner for me ang jollibee kc favorite din yan ng baby ko since nung 1 year old pa lang cya hnggang ngayon ba mag 2 na cya .sa totoo 3x sa isang linggo o higit pa pumupunta kmi sa jollibee na mlapit samin..hehehe at nakakatuwa kc pagnakikita niya logo o pic ni jollibee..sumisigaw o binabnggit nya "jaabee" sabay turo!hihi btw, 1st bday ng baby ko sa jollibee din kmi ngparty party.. Thank you jollibee dhil pag nakikita ka ng anak ko,binibigyan mo rin cya ng ngiti at kasiyahan. The happiest moment was when my sister who now lives in Italy with her own family visited us a few years back and saw her gobbling up bite after bites of the Filipino all time favorite spaghetti- Jollibee Spaghetti! Everytime we talk on the phone she would always tell me how she misses it. Those pictures are so cute! 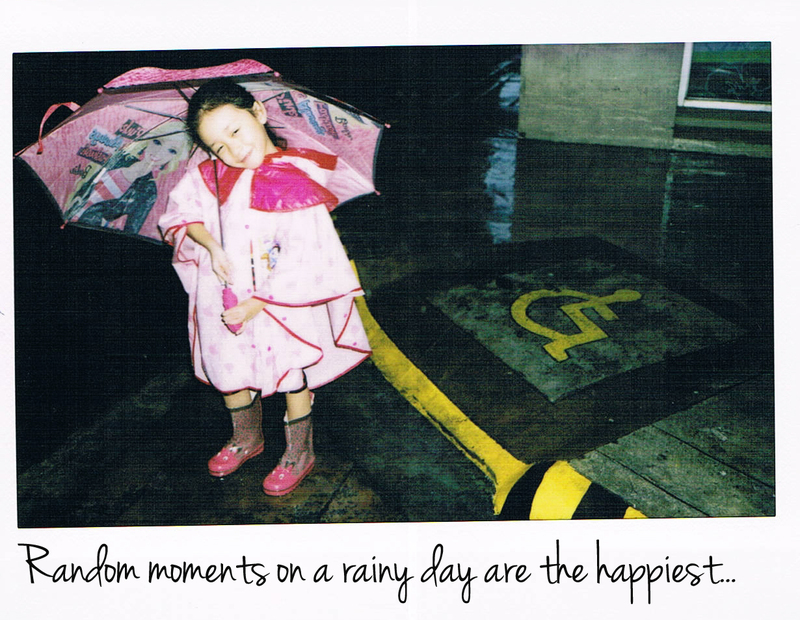 That's what you call "Genuine Happiness" and you can never fake it, especially when it comes from a child. Jollibee is one of my kid's favorite fast food. There's one branch near our place and it is open 24/7. So whenever I feels like not getting up and just wanted to stay in bed the whole day, Jollibee is our Savior!! Thank God! :). Their Spaghetti is the meatiest of all! Whenever I see my daughter eat spaghetti, I want to ask the Manager how they cook their Spaghetti hahaha!! wow! so fun of you to have that challenge! I think my happiest moment with jollibee spaghetti is when i and my baby boy are in jollibee and he loved it so much! I really love your blog mommy, very fun pictures and indeed happy moments eating together with Jollibee Spaghetti especially with the family. My kids loves to eat Jollibee spaghetti too and me too. Now I'm craving LOL. Wow! Lovely pictures! It definitely depicts the strong bond that you have with your loved ones :)) Way to go! Michelle. Walang Jollibee sa Boracay. It made me miss my jolly Spaghetti even more. :( But yeah, Kalibo is just a few hours away. I can always ride the boat to get myself a Jollibee. i love your post!! it was so creative..
Wow! The photos are superb and the way you composed a blogpost is just special. You really put an effort. Your photo paint a thousand miles very touching from the start to finish.. 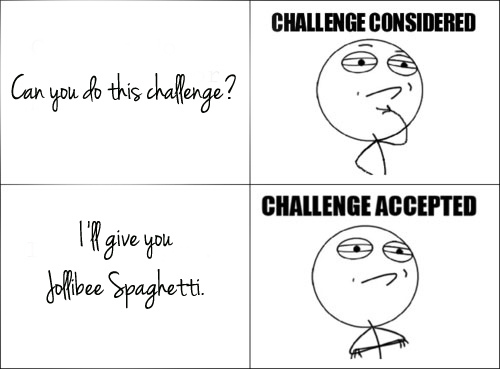 The challenge is so cool and the photo you took were really candid and shows how fun life is with Jollibee spaghetti. Awwww! I enjoyed reading your post sis. Medyo mahaba pero true enough, one can be the happiest with Jollibee spaghetti. I can say that cos my daughter is the same. She is the happiest whenever we go to a Jollibee store. Deadma ang pizza nyan sa kanya basta nabanggit na si Jabee. Haha. This is a fun post to read. I love seeing genuinely happy family. My daughter is the happiest too whenever she eats Jollibee spaghetti. 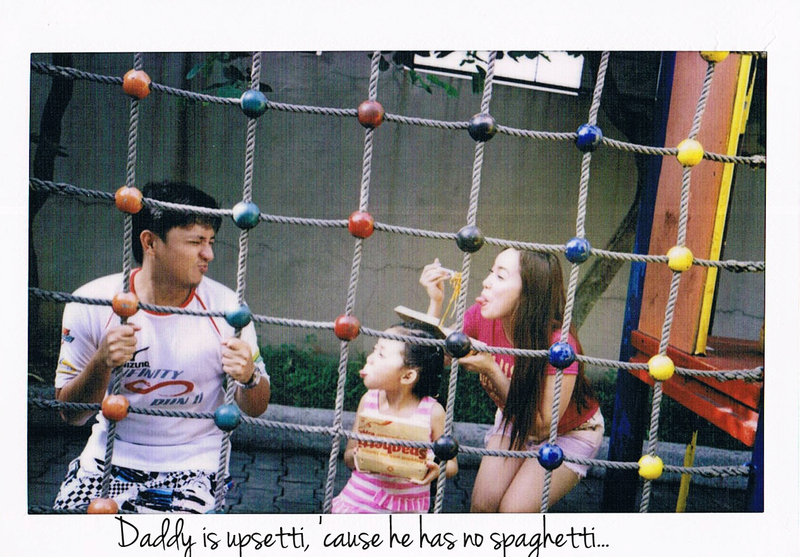 Take note, the spaghetti has to be from Jollibee for her to eat. She actually, knows the sweet and yummy taste of it. It gives her much joy every time my husband brings home Jollibee for her after work. Winner talaga ang spag ni Jollibee - its on their sweet sauce which kids love which until now my bagets even malaki na. They will settle for those three orders, as in always - regular yum, chicken joy and spaghetti. The challenge looks fun and you have a polaroid camera to do it. Amazing!! Looks like you had fun during the challenge. I love their spaghetti and I that says a lot since don't really eat spag that much. ooh seems a lot of fun. My kids love jollibee and they are always delighted and looking forward to go there. Great and creative pictures! I think you nailed the challenge! Jollibee spaghetti sure brings back a lot of good memories from my childhood. Its so cutte! hihih... Cute and sweet moment. :) and the insta camera makes it more memorable.. Back then iiyak ako ng sobra just to make my mom buy a jolly spaghetti :) But now I love their peach mango pie! yey! My happiest moment with Jollibee Spaghetti just happened a few months ago. My daughter just recovered from sickness and she doesn't wanna eat anything. I am so worried, so suddenly thought of an idea. I bought her to Jollibee, ordered Spaghetti and gave it to her. Well I was amazed with her reaction. She giggled and ate it. She really can't resist it, it's her favorite! "Mama, hati tayo para may makain ka din"
Oh that was sooo touching. To see her eating would already make me happy but what she did make me the happiest. 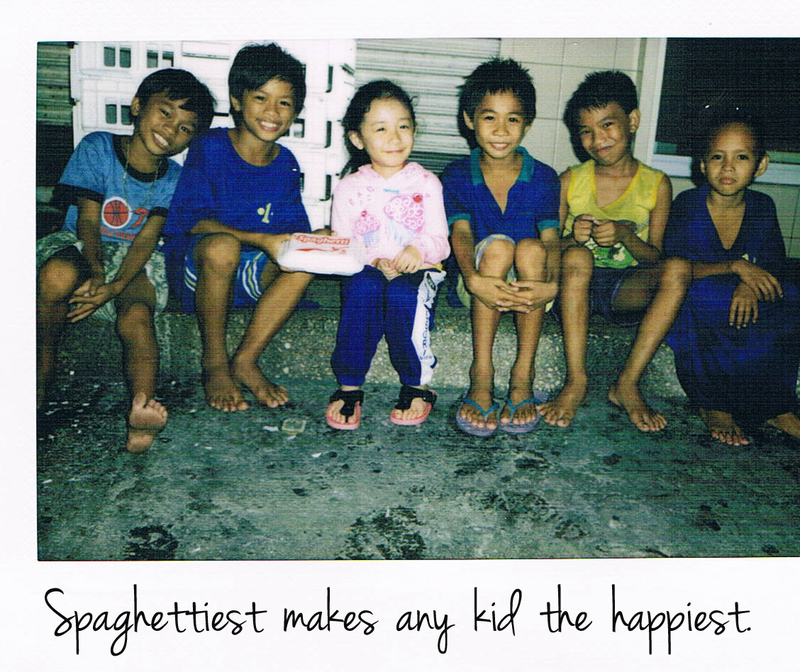 Jollibee spaghetti is really yummy that it makes kids Happiest with the Spaghettiest. great photos there hun! so much happiness and family bonding in your photos! somehow the playground reminds me of SG. I love jollibee too and my daughter but she haven't seen jollibee for so long now! Your family is beautiful! Bless you..
What is your happiest moment with Jollibee Spaghetti? Probably when I was still living in the Philippines, we usually go there every Sunday after church. Memories..
My happiest moment with jollibee spaghetti when i was in college.That was 1997.my first ever jollibee spaghetti.Dahil laking probinsya from Zambonga Sibugay at walang jollibee sa amin.isip ko noon mga mayayaman lang ang makakain ng jollibee.when we move to proper city of Zambonga para mag aral ng college,one of our neighbor volunteer na samahan ako for enrollment,right after ma enrolled she told me na kakain kami sa jollibee at libre niya ako.medyo nahiya pa ako na may kasamang excitement dahil at last natupad na dream ko na kumain sa jollibee.i felt kids that time.ang babaw ng kaligayahan ko dahil sa isip ko in reality makikita ko na si jollibee in person.Naka take out pa ako nun.dahil ni kwento sa bago kong friend na firt time kon kumain ng jollibee spaghetti na sobrang sarap na natikman ko sa loob ng maraming taon.Until now hinding hindi ko makakalimutang ang friend ko na unang nagpakain sa akin ng jollibee spaghetti.Now i have a happy family and two kids..Ni share ko ang happiness sa pamamagitan ng Jollibee spaghetti. Growing up with Jollibee Spaghetti is one of the happiest moments of my teen years. I love it then, and I love it until now that I have three kids. Even my kids enjoy Jollibee Spaghetti! Partnered with ChickenJoy and Yum with Cheese, our happiness is complete. I like the illustration of how your hubby reacted! Parang pakipot na nagive in din! Hehehe! My baby is so picky in terms of eating. But Jollibee spaghetti is the only food he will eat the most, we even share eating. I'll also never forget his first birthday party in Jollibee Bluewave.. what a memorable experience that me and my hubby worked hard just to give our kid the happiest Jollibee party ever. It's the only spaghetti that my very pihikan daughter eats. If she doesn't want anything else, Jollibee spaghetti it is. Kids and Kids at Heart love Jollibee esp. the spaghetti. I love all your memories you made with Jollibee Spaghetti it truly brings your family closer and truly a happiest and memorable moment. Jollibee did a great job on giving the challenge a fun way to give the happiest moment with the family and a great way to teach our children to share. Maia was so nice to know how to share her food and she is so cute! I remember my childhood memory with Jollibee Spaghetti and it truly a part of my kids memories too. My happiest moment is when my son christening happen in Jollibee. The kids loves Spaghetti with burger. Parang it's a tradition na that if get to visit Jollibee we should always have Jolly Spaghetti. Every visit in Jollibee is always the happiest moment since we all enjoy eating together. I actually observed that kids as young as months old babies would cling to the Jollibee mascot like it is their parent. No wonder hangga't may bata may jollibee! My sister loves jolly spaghetti so much, every time we eat out, Jollibee is a must for her spaghetti! Beautiful photos as always! Jollibee is really for the kids and the kids at heart! 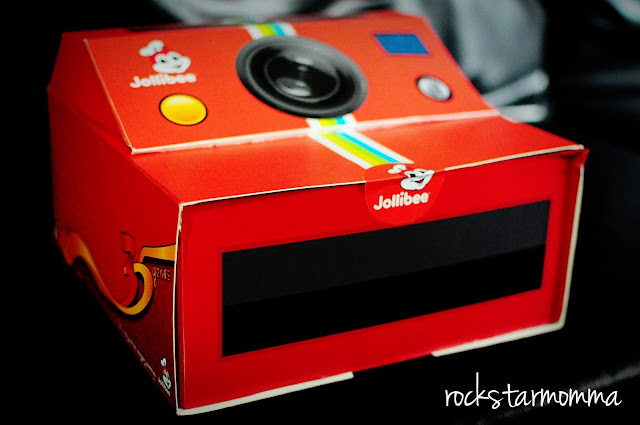 great photos :) i also have many happy memories with jollibee :) until now super love ko si jollibee. ang sarap ng spaghetti at chicken nila talagang babalik balikan :) my daughter love it too. My happiest moment with Jollibee Spaghetti happens every year. Tuwing birthday ng panganay kong anak. Ang sarap ng feeling na nakikita mo ang anak mo na may ngiti sa kanyang labi habang kumakain sa favorite nyang lugar "Jollibee" at kinakain ang kanyang paboritong Spagetti. Lalo na 'yung 7th birthday party niya last year, nag-celebrate kami sa school ng anak ko with her classmates and Jollibee and Twirlie sobrang saya ng mga bata lalo na ng anak ko dahil nakasama niya sila Jollibee at mga classmates and teachers niya at nakapag-share at nakapagpasaya din siya. So, ngayong First birthday din ng second baby ko, magse-celebrate din kami sa Jollibee.